Everyone is aware of T.I.’s troubles; his recent release from jail for felony gun charges was a redemption song of some sorts. We saw him rise, fall, only to rise again through a tenacious spirit, commitment to do better, and, if given another chance, the ability to redeem himself and the people he represented. Currently, his film Takers is number one in the box office. He recently married his long time love, and all that was taken from him, was returned. This morning I woke up to the news that our redemption son, T.I., was arrested for drug possession in West Hollywood. I don’t call him “redemption son” to glorify him, make him more than a human, but he was on the path of second chances, a path that many men do not get. I won’t take the stance that many bloggers or writers will take over the next few days about this matter. This is bigger than a drug charge. Bigger than what may happen if he’s convicted. Bigger than the social buzz that will soon die out after a couple of weeks of talk. This is about a change in mindset. God allows for us to have second chances, not for us, but for the race we run for others. Everyone is bearing witness to his life (the cost of being a celebrity), but until we begin stripping off the things that easily beset us, or slows us down, we’ll be eternally weighted with habits that trip us up while running our race. The race set for T.I. and for all of us is one that comes with its own set of obstacles. Life is hard enough without adding to its troubles. It’s when we refuse to lose those dead weights (people, habits, lifestyles, mindsets, etc) that we weigh ourselves down, slow our progress. The natural talent that Clifford, yes Clifford, has is God-given. His charisma, his charm, is natural ability to tell a story over hard 808 beats is one that many rappers try to emulate but can never master because those skills were given to him exclusively. In some way, shape, or form, there will be a price to pay for this mishap. Whether that comes through Clifford’s family, career, or life, there will a price to pay. But, just like God always does, there will be another opportunity for redemption. It’s the essence of who He is. Clifford will be crucified a million times over, but because our big brother Jesus took to the cross first, Clifford will have the opportunity to rise again. 1 Corinthians 9:24 Do you not know that those who run in a race all run, but only one receives the prize? Run in such a way that you may win. As always — great interpretation. I think understanding WHO he is will one day lead to the full potential that’s within him. If he never learns, then we may never see that. You’re right — I’m not going to start preaching on your blog, but you’re absolutely right. This is excellent… So many celebrities and non-celebrities need to take heed to this. i think once we all realize that we live our lives not for ourselves, but for God and we run the race not for temporal and earthly rewards, but heavenly treasures; we will have a new sense of perspective. 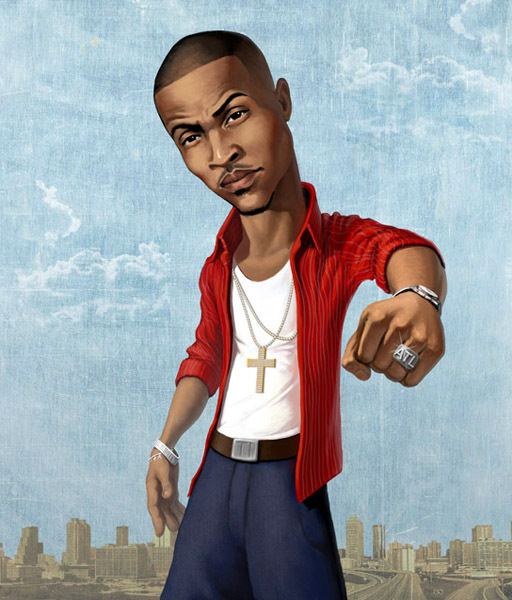 T.I., as cool and as smooth as he is, is caught up in a world wherein he feels he is invincible, i.e. above life. what he doesn’t understand is “this life is not his own.” Most of us feel this is our life, our body, our job, our money, our fame, our fortune, our mind… but it’s not. it all belongs to God. if we understood this, we would live our life and devote our freewill to making decisions that fail to give us the temporary authority/pleasure, but ultimately give God glory.